You might not guess it from looking at me, but there are few things I enjoy more in life than playing soccer. My history with the game began in Germany where I joined a youth league at the age of six. Even though I know those games unfolded as a gaggle of tiny kids swarming on the ball wherever it went, when I remember them, they were tactical, strategic matches filled with passes and formations and plays. Growing up, youth soccer dictated my schedule through different seasons. Tuesdays and Thursdays were for practice. Saturday mornings brought games, oranges at halftime, and cleat-stomping trips to get pizza. When I lived in Japan, soccer introduced me to nearly all of my friends. We bonded over Nintendo games and trips to Tokyo and girls, but most of all, we played soccer together. The first job I ever had was delivering papers across a section of the Army base where we lived. I was terrible at it, because while I was delivering papers I knew that my friends were running around with their shoes off, playing four-a-side games with backpacks and bicycles for goal posts. It wasn't until I headed back to the US that I learned that soccer (and really all sports) were dominated by a specific class of people: jocks. Even though I'd seen THE BREAKFAST CLUB a dozen times, it hadn't clicked for me that the kids who wore Depeche Mode t-shirts and painted their nails black weren't welcomed in a place like a soccer park. In my community in Japan, those divisions weren't so severe. But back in the states, my friend Paul made the point very clear: the drama club kids and the soccer kids didn't mix. I thought it would be different for me since I actually liked both things, but when the puffed-chested assholes in my P.E. class walked by me calling me a "fag," I thought that maybe Paul was right. There were exceptions, of course. I remember one guy on an opposing team in my youth league who always held his moppy hair back with a headband. I did the same with my growing mohawk and we'd always nod to each other when our teams met. I'm sure there were others, but it was largely a time when you had to pick sides and that always bothered me. Fast forward to adulthood. After years of sedentary jobs, playing music in bands, and no outlet for soccer, I had lost touch with one of the things that made me the happiest in my youth. And I'd gotten fat. I still watched games on TV and took trips to see MLS matches across the country, but I had nowhere to play. I knew that I was too out of shape to contribute to a real team, and once I'd picked my side of weirdos and musicians and artists, I had gone in whole hog. I didn't know any jocks and I was pretty sure that they'd have the same attitude towards me as adults that they'd had in high school. But I was wrong. Soccer, maybe more than any other sport, attracts people of all types and shapes and backgrounds. I've played pickup soccer on a regular basis for 14 years now and no matter which city I've played in, the setup is basically the same. Former competitive players, novice players, soccer moms and dads, soccer kids, bike messengers, punks, and dudes with full sleeve tattoos blowing off steam before heading to the bar all come together to play soccer wherever there is space. In 2007, I was visiting Austin and trying to find a pickup game on a Sunday. I knew about the games at Zilker, but a quick drive by convinced me that those weren't the games I was looking for. 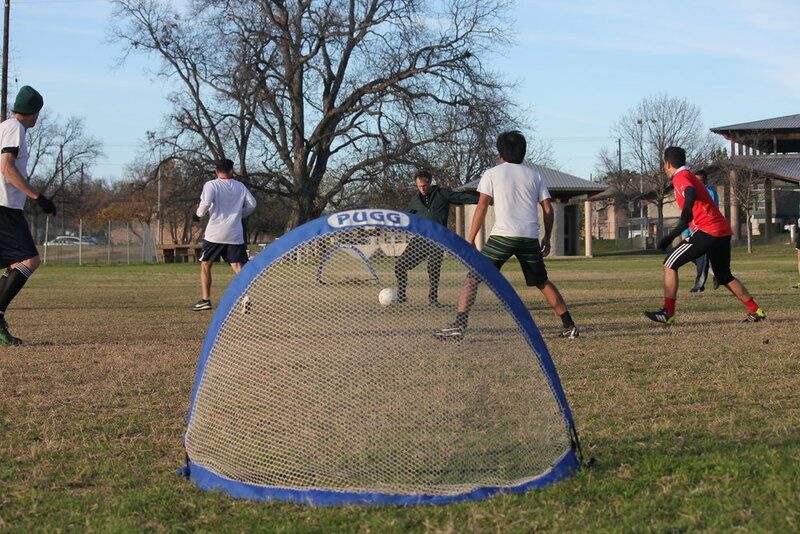 Instead, I found a post on a message board about Anarchist Soccer at Rosewood Park. That sounded more my speed. And yes, Anarchist Soccer is a real thing. I truly believe that when we remove the competitive focus from sports, we can can create entirely new kinds of experiences, but that's not something that people generally learn if their only exposure to sports has been through winner-takes-all situations. Even pickup soccer isn't always friendly. People get worked up, excitable, and focused on winning or scoring rather than on playing. In normal pickup games, I've been barked at for screwing up. I've seen people run off the field and out of the park because they were made to feel like they weren't good enough to play. Sometimes strong players want to turn into coaches for weaker and slower players, which can feel intimidating. And in the worst situations, someone gets hurt because a player's drive to win the ball overruns their desire to protect other players, even opponents, from an unnecessary injury. But in Anarchist games, at least for the most part, we minimize those problems. We don't pick teams with captains. We don't keep score. We don't play shirts against skins. We don't tell anyone that they can't play, and we don't keep anyone isolated from the action because they aren't as fast or nimble or skilled as anyone else. Sometimes folks need a little reminding that Anarchist soccer is meant to be completely inclusive so that everyone has fun working together. Sometimes a competitive instinct or training kicks in and tempers flare up. But most of the time, the game just flows from this spirit that all are welcome to try their best, and it's a beautiful thing. I'm glad to have finally found a place where my passion for soccer isn't held back by traditional sports expectations. I'm glad to have an outlet to exercise with friends and strangers alike, in an environment where the score matters less than the effort and the attitude. Sports necessarily engender an "us against them" vibe. By their nature, they encourage a hierarchy based on skill and accomplishment and they encourage opposition. Whether as a spectator or a player, the adrenaline rush to win often pushes people over the line that we would normally consider civil behavior. All of this can make for exciting events, but at every level from professional matches to league games, to pickup kickarounds in the park, I've seen sports bring out the worst in people, too. When my friend Paul made his observation--that the sportos and the weirdos didn't mix--and it had more to do with social expectations than athletic prowess or interest. I think sports could use a little more anarchy and a lot more compassion, and I'm thankful that Anarchist Soccer provides a blueprint for that to work!